Orange County Mayor Teresa Jacobs and Chief Information Officer Rafael Mena were honored to attend a meeting at FEMA Headquarters in Washington D.C. on Friday, May 30, to demonstrate innovations in emergency response. 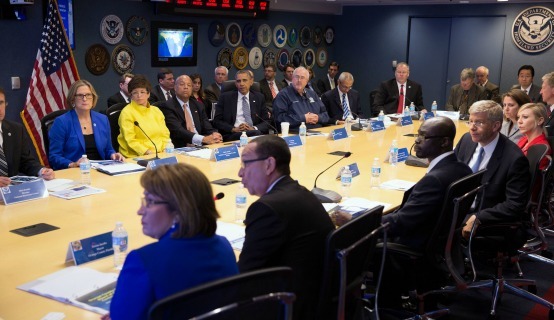 The briefing focused on federal government’s efforts to prepare for and capacity to respond to severe storms and included President Barack Obama, Assistant to the President for Homeland Security and Counterterrorism Lisa Monaco and 19 other representatives from Federal, State and local agencies. One of only three organizations selected, and the only county in the nation invited to give a presentation, Mayor Jacobs and CIO Mena joined officials from the State of Virginia and the Department of Energy in discussing the technology innovations that will better inform and involve the public in preparedness and response activities. “I was incredibly honored and so proud to share with the President and his response team all of what we are doing here in Orange County to help our citizens and residents prepare for and stay safe during and after extreme weather events,” Mayor Jacobs said. For Orange County’s presentation, Mena gave overviews of the OCFL Alert and OCFL 311 mobile apps that assist residents before, during and after emergency situations. OCFL ALERT is a first-of-its-kind emergency notification and information smartphone app that provides critical information during times of emergency (Android | Apple). Such life-saving information includes open shelter locations, water and ice distribution centers, evacuation routes, and much more. The OCFL 311 smartphone app allows users to photograph, pinpoint and report problems from potholes to hazardous sidewalk cracks directly from their smartphone to Orange County’s 311 Service Center (Android | Apple). Both apps are free and available for download to both Apple and Android devices. Information on the new OCFL News app, Orange County’s latest smartphone app which was unveiled during Mayor Jacobs’ remarks at the State of the County on June 6, was also shared (Android | Apple). OCFL News provides citizens with breaking news and information about their government. Additionally, the President directed his team to maintain close coordination with state, local, tribal and private sector partners and apply the lessons learned from Hurricane Sandy and other recent storms.